The "We Know Jack" jackrabbits anxiously awaited for their artist to adopt them. "We know Jack" was a public art project and fundraiser to benefit the Vacaville Museum located in Vacaville, California. Between July 2014 and January 2015 twenty-five large, long-eared, fiberglass jackrabbits were painted, decorated, and embellished by twenty-five Northern California artists. 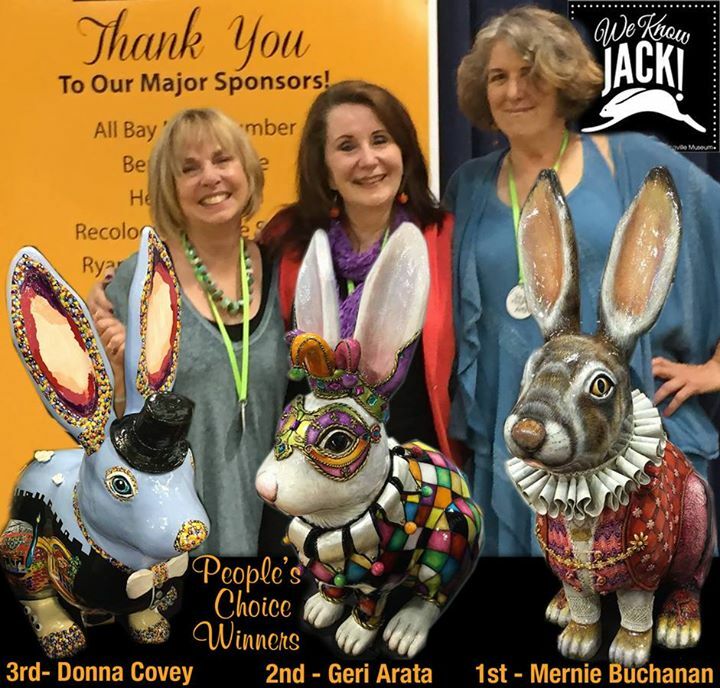 That's right, each artist had six months to complete the adornment of their individual jackrabbit before the bunnies would be auctioned off at a gala event called "Hit The Road, Jack" on June 20, 2015. As one of the artists selected to participate in this public art project and after detailed planning I'm happy to say that my jackrabbit, "JACK ABOUT TOWN" was auctioned off to the highest bidder, Herman Rowland, CEO of JELLY BELLY FACTORY. I know "JACK ABOUT TOWN" will enjoy his new home at the JELLY BELLY FACTORY located in Fairfield, CA.